Above: Firefighters battled a blaze that destroyed a pole barn at the Hubbell Family Farm on Wednesday, March 9. Photo by Rebecca Andre, Mountain Girl Photography and Design. 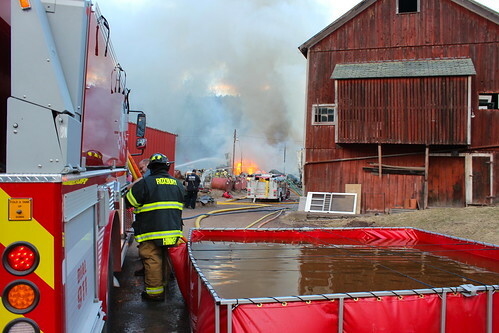 An afternoon fire destroyed a pole barn and injured two firefighters at the Hubbell Family Farm on Route 30 outside the Delaware County village of Margaretville on Wednesday, March 9, 2016. Although officials at the scene were unwilling to state the cause of the blaze, John Hubbell said that it likely began when round hay bales sitting outside the pole barn caught fire. On Wednesday night, Margaretville Fire Chief Gene Rosa confirmed that the cause of the fire was accidental. Above: An excavator housed in the pole barn was destroyed by the fire. Photo by Rebecca Andre. The fire began around 4:30 p.m. and destroyed the 50 foot by 80 foot pole barn, which stored construction materials and heavy equipment, including an excavator and a logging skidder, according to John Hubbell. At 5 p.m., traffic was being redirected both ways on Route 30 north of the scene at the Pakatakan Farmers’ Market and south at Kelly Corners. Firefighters remained on the scene until after 8 p.m. Their efforts prevented the flames from spreading to the surrounding houses and buildings on the historic 19th-century homestead, including the sap house located only 75 yards away. Above: View an album of photos from the fire. Photos by Rebecca Andre, Mountain Girl Photography and Design. “All we lost is a building,” said Burr Hubbell. Two Margaretville Fire Department firefighters were injured while fighting the fire, Rosa said. One firefighter sustained minor injuries and drove to Margaretville Hospital. A second firefighter was transported to Margaretville Hospital by ambulance. As of 9:30 p.m. Wednesday evening, Rosa was still “waiting to hear” the extent of the injuries sustained by the second firefighter. Above: Firefighters at the scene. Photo by Rebecca Andre. According to Terence Johnson of the Margaretville Fire Department, the call about the fire came in at 4:38 p.m. on Wednesday afternoon. Black smoke could be seen pouring across the mountains towards the hamlet of Halcottsville on an unseasonably warm and perfect March day. Five fire companies responded to the blaze. The fire departments of Arkville, Halcottsville, Roxbury and Margaretville worked through sunset to gain control of the building fire, which spurred a brush fire on the same property. The Fleichmanns Fire Department was also briefly at the scene. The fire was fought with water pumped from the East Branch of the Delaware River across the railroad tracks and Route 30, according to Harley Jenkins of the Margaretville Fire Department. Above: As evening fell, the fire was largely under control. Photo by Rebecca Andre. This was the second fire of the day for the Halcottsville Fire Department. The first was a small brush fire just above the property of John Biruk, according to John Downey of the Halcottsville Fire Department. “I was just getting home and cleaned up when this call came through,” Downey said. Concerned neighbors kept the crowd of firefighters well stocked with bottles of cold water. The fire at the Hubbell Farm was just one of many small fires that blazed across the Catskills yesterday, prompting first responders to call for diligence because of dry conditions. Above: Route 30 was closed as first responders battled the fire. Photo by Rebecca Andre.